While adding a new pet is a fun and exciting family project, choosing the perfect fit can be challenging. Some families have always had a certain breed and they are used to the demands and quirks of the breed, while others are embarking on a journey to get something different or even their very first dog. For example, the Smiths have had Labradors going back generations. They are used to the exercise requirements, grooming needs, approximate costs, and life style of your average Labrador. But what happens when Mr. or Mrs. Smith wants to adopt a shelter pet, a Border Collie or perhaps even a Pug from a rescue group? Maybe they want to get a purebred pup and raise it from the time it leaves its mother and are researching reputable breeders. While all of these dogs can be wonderful pets, they are all very different in terms of needs, health issues, and potential expense. Choosing the right dog for you and your family’s life style is vital for the success and happiness of your future pet. For example, choosing an active breed like a Border Collie or a German Shepherd because you hike on Sundays sounds like a great idea. However, if you work long hours the remaining six days a week these breeds may not be ideal. An adolescent mix that looks adorable on the shelter’s adoption page may seem ideal as well, but a “teenage” dog is likely to require much more regular mental and physical exercise than a slightly older dog. You may have to secure day care or dog walkers for these days. Left at home alone these dogs could become bored and become destructive, damaging both property and the human animal bond. How much exercise can I routinely provide the pet? The exercise requirements of both mixed breed and purebred dogs vary. The average Husky may love going for a 4-5 mile run on a routine basis, whereas the loveable Bulldog maybe perfectly content moving from the couch to the yard, and then back to the couch again. While it can be a little harder to determine with the activity level of a mix, many good shelters and rescue groups assess dogs and use the ASPCA’s Meet Your Match researched based adoption programs or similar means to determine the right fit for you and your family. Breed specific rescues and many other rescues have their adoptable pets living in homes with foster families that really get to know the individual pets and can share that information with adopters. How much time will the animal spend alone? With family? Different dogs require different amounts of supervision and mental stimulation. As a rule, Border Collies and German Shepherds, for example, are breeds that need continued engagement and stimulation, while other breeds may be more likely to be content if left alone during the day. Some dogs thrive on continued engagement with family and children, while other dogs may not be ideal when there are small children in the home. These are general rules and even pups from the same litter can be as different as your own family members are from one another. Age is another key element in how much time a pet can spend alone or in need of engagement and stimulation when a family member is home. Do you have the time to devote to raising and training a puppy that will not truly be an adult until two years of age or would it be better to look for an adult dog that needs a new home? How long will the pet be alone during the average work day? I work long hours, however my spouse works opposite shifts. Either way someone is usually home while the other is at work. Some may argue this is the secret to a happy relationship, but that is a discussion for another blog. However, it is essential for having some breeds. For example, we have a German Shepard mix, and while she does enjoy her time on the couch, she needs to be engaged with the family and occupied. If left home alone for long hours she has proven to be mischievous. Do I have a backyard or am I willing to walk our dog for exercise and to relieve themselves? All dogs need to exercise, but the exercise needs for a Greyhound or a Whippet mix vary greatly from the average Pug or Shih Tzu. While a backyard is helpful, walking our dogs provides needed exercise and strengthens the human animal bond. If you love to take long walks daily, the breathing problems that English Bulldogs, Pugs, French Bulldogs and other brachiocephalic breeds have would mean you would not be able to bring your pet along, especially in warmer weather. Where will the pet be housed? Where will the pet sleep? Where will the pet be kept when I am not home? While some families are happy to have the family dog sleeping at the foot of the bed other families are less than open to the idea. Size of the pet is a factor in these situations. For example, if you prefer the family dog sleep in the bed a Great Dane or a Neapolitan Mastiff may not be the ideal breed for you. Also, are you willing to have the pet roam free throughout the home, or will the pet be confined to a certain area, and if so what does that area look like? How big will the area be? Who will be cleaning up after the pet? Who will be feeding the pet? Who remembers trying to negotiate with our parents for a puppy as a child? “I’ll clean up after Fluffy mom, don’t worry” Or “I’ll get up early and walk Lassie every morning before school.” How many of us kept this promise? And how often was mom and dad taking care of the family dog while we went to soccer practice? If mom and dad are already stretched thin between chauffeuring Timmy to baseball and Lizzy to Irish Dance, an active breed puppy may not be an ideal addition at this time. The division of labor is important when adopting a pet. If you expect your children to participate in caring for the pet, make sure that the size of the dog you select is manageable for children both in strength and temperament. A big dog may be too powerful for a child to walk without assistance and a high strung, energetic Australian Cattle Dog may try to herd running children and nip at them. Who will be training your pet? How much time am I prepared to dedicate to training? Will I attend training classes? Training is important for every dog! Some dogs not only require training but continued training and structured classes or exercise. 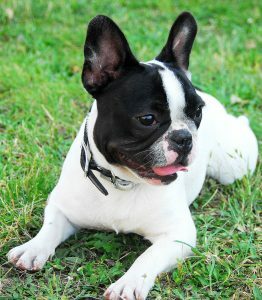 For example, our French Bulldog is perfectly content with basic obedience training. However, Border Collies may need not only basic training, and because of their mental prowess and energy may need to go to agility or fly ball weekly. Who will take them? Can we carve that time out of our schedules to dedicate to that activity? Are these thing we think we will enjoy together and strengthen our bond or are they unwanted chores? How much am I willing to pay for a pet? Pets cost money. Some of us are willing to spend thousands at a breeder or are perfectly content paying the $100 adoption fee at our local shelter. Either way we are providing a home for an animal, but budgeting for the expense is a legitimate consideration. How much do I budget for treatment costs for my pet? How much do I budget for food costs? This is always a tough question. Some breeds are predisposed to some medical conditions that are costlier than others. French Bulldogs, while awesome (I have a Frenchie and he’s awesome) have a multitude of medical problems, and those expenses add up. Also, large breed dogs tend to cost more. They eat more, their medications are more expensive, and they tend to have more expensive orthopedic issues. Large dogs also often have a shorter life span. While these questions are not fun, they are tough questions we need to answer when selecting a dog. You may wish to consider researching the cost of pet insurance also. How often will the pet need grooming? Do I groom the pet or will the pet need to see a groomer routinely? My Shepherd Mix is perfectly content getting a bath in the tub at home. In years past I had a Cocker Spaniel who needed a trip to the groomer every six weeks. I loved both dogs, but they had very different grooming needs. Planning for these needs and expenses is another factor when considering the ideal breed or pet. Is the place I am getting my new family member from an ethical source? There are good, responsible breeders of purebred dogs that care very much about their dogs and the breed. These breeders seldom have a constant supply of puppies from different parents and will want to know a great deal about you and your family before placing a puppy with you. There are also backyard breeders that don’t really appreciate the care and research that should go into planning a litter. And, tragically there are puppy mills that supply the demand for the appealing young puppies of the currently popular breeds sold in pet shops and through online ads. Puppy mills are a very real animal welfare issue in this country and the cruelty of the way they use dogs for profit should never be supported by the purchase of a puppy bred this way. If you know you want a certain breed, take the time to do your homework and find an ethical breeder. You should be able to meet the parents of the litter and get references from current owners of dogs bred by that breeder. Another alternative is to look for a breed specific rescue. They exist for almost every breed and can be easily found with an internet search. The animal rescue movement in our country has grown by leaps and bounds the last several years, which is wonderful. But before adopting, research the shelter or rescue you are considering. What kind of information can they provide to help you find a compatible family member? What health screenings and services are included in the adoption fee? Does the shelter or rescue utilize behavior assessment and provide behavior support if needed? Before you look at the adoptable animals page and fall in love, compare area shelters and rescue groups to find one you think will take care in finding good homes for the pets in their care and the right pet for your home. These are some questions to consider when choosing a dog. Mixed breed or purebred these considerations are helpful when choosing to add a new family member. All dogs have the potential for greatness and selecting a dog that fits your lifestyle is a step in the right direction. When selecting a dog please read, ask yourselves these questions, and feel free to talk with your Veterinarian about these decisions. We are always happy to help.